When I was in Dubai a couple of years ago I went to Logma, a modern Middle Eastern restaurant where I first tried Qatayef. 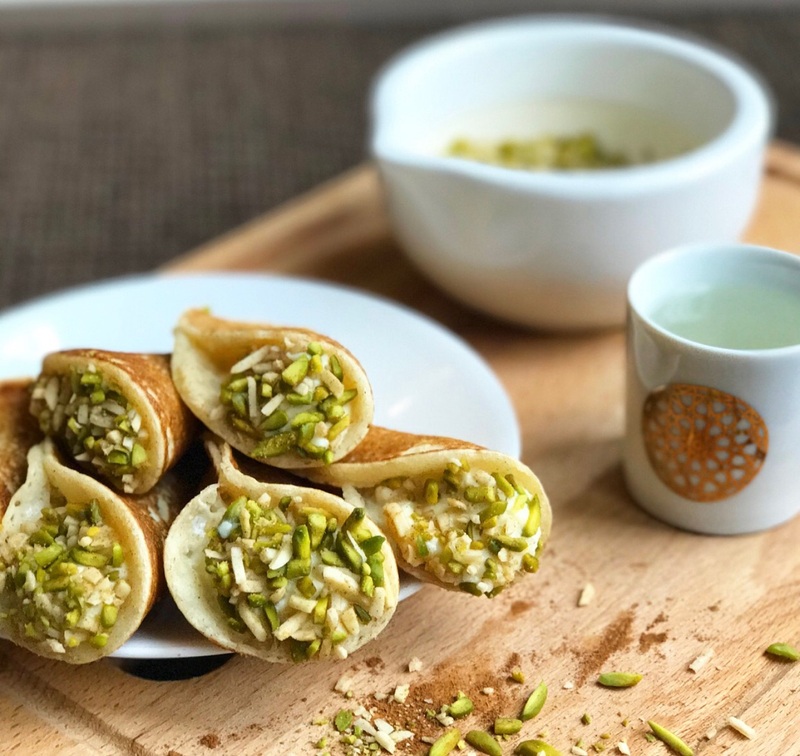 Qatayef is a fluffy, Arab style pancake that’s stuffed with sweet cream and nuts, and it’s absolutely amazing. It’s often deep fried, but theres a version that’s not and it’s much lighter and easier on the stomach – it’s called Qatayef Asafiri. It’s so fragrant and delicious and I’m sooo excited to share this recipe with you guys! I hope you enjoy it and let me know if you give it a go on Eid! P.S. Click here for yesterday’s Eid recipe! Pancakes ready to be filled. See how they are only cooked on one side! The other side is pale and bubbly. 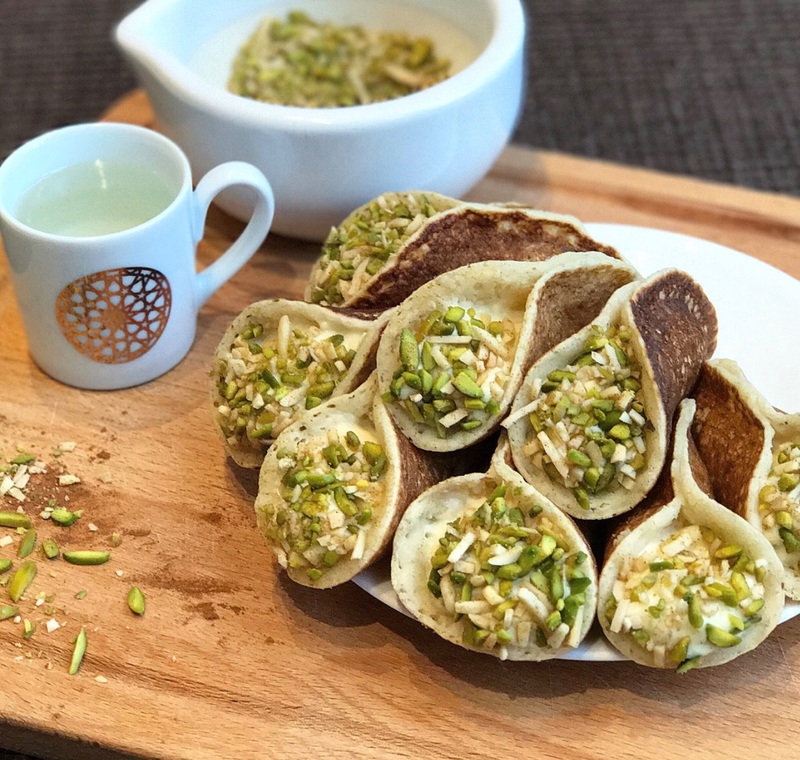 Fluffy Middle Eastern pancakes stuffed with sweet cream and nuts! Begin by making the dough - mix all the dry ingredients together. Then stir in the wet ingredients until everything is smooth and fully combined. The mixture contains yeast so it needs to be left to rest for 1 hour. At this point you can make the sugar syrup by adding the sugar, water, orange extract and lemon juice to boil until all the sugar has dissolved. Remove from heat and allow to cool. For the cream, add all the ingredients to a pan apart from the corn flour and water over a medium heat. Mix the corn flour and water separately and add this to the cream mixture once it starts to boil. Continue to mix thoroughly for about 10 - 15 minutes until the cream becomes quite thick and gloopy. Allow to cool. For the nut filling, crush the nuts and mix in the cinnamon and sugar. Once the hour is up, you can start to make the pancakes. You will notice that the dough would have become a lot thicker. Give it a stir before you begin cooking. Add a small amount of oil to a pan and heat on a medium flame. Using a small ladle, add a small amount of dough on to the pan and leave it for about a minute until bubbles form. The pancake should be removed and only cooked on ONE SIDE (see picture above). Cover the pancake in a cloth so that it remains soft and is easy to fold later. This is very important. Once all 15 pancakes are made, add the cream and fold the pancake in half. Press the sides of the pancake to close it half way leaving one half exposed. Dip this part in to the nut filling to coat it. Ok this is amazing. Number one I can’t eat eggs so whenever I try a egg free pancake recipe they always turn out wrong. This is something I’m definitely going to be trying. But first I need to buy orange essence! Ah I’m so happy you like the recipe! Let me know how it turns out!